Average media consumers are staggering under the weight of spam e-mails and information overload. Think you can’t compete? Think again! While some people may believe print advertising has grown stale, the “digital deluge” means there has never been a better time to highlight beautiful print promotions. Get our top recommendations below, and at the end a discount on your 1st order! Images are able to evoke strong emotional feelings and are often what makes someone stop to look at an ad, an article, or a commercial. Therefore, the image(s) you choose for your print marketing can make or break your campaign. Before looking for the image(s) for your brochures, posters, or direct mail pieces, first think about your target audience and the message(s) that you wish to deliver. Does your business cater to families with children or to middle-aged executive. Do you depend on local traffic or is your business a destination that people may wish to include in their travels? What feelings do you wish to evoke in the potential buyer? Are you selling useful, time saving products or are you promoting relaxation and luxury? These types of questions can help you to decide what message you wish to convey in your print marketing and help you find the best images for your business. Once you have narrowed down the target audience and the feelings or messages that you want to communicate, only then is it time to look for the right image. Note that we said “image,” not “images,” because with so little time to catch the consumer’s attention, you probably should focus on one primary photo that will capture the attention of your audience. Customers spend less than 10 seconds evaluating advertisements and promotional materials, so ​be sure to make the most of those 10 seconds by including only the important information. In very specific instances, such as those that are heavy on technical product or service information, you may use longer copy than usual — but these are definitely the exception and not the rule. Using consistent language is also important, as it helps create brand recognition and promotes trustworthiness. Use the same product names, slogans, and character branding on each version of your advertising. For instance, if your business is, “Kat’s Cleaning Service” and your logo is an image of a cat wearing an apron—put that symbol on every business card, brochure, or poster printing you have made. Most importantly, make sure that you have multiple eyes proofread your copy. Do not limit your copy editing to your word processor’s spell check function. Homonyms, proper nouns, and regional spelling conventions are frequently missed by spellcheck software. Everyone makes mistakes that are easy to overlook, the more people you can have proof your copy the better. Even the best writers in the world have a whole team of editors that help them keep their words crystal clear and without errors and you should do the same. 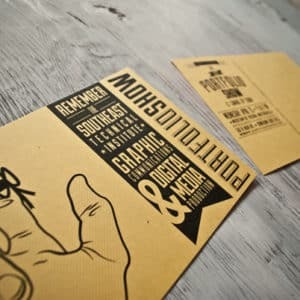 The three most important decisions when setting up the fonts that will work best for your print marketing campaign are typeface, sizing, and color. How do you know which direction to take when there are so many options available? It can be tempting to go big, bold, and wild to set yourself apart from the competitors, but how do you know when this is a good idea—if ever? Typeface – Times New Roman, Helvetica, and Arial are the three most popular typefaces for print marketing. This is the result of a variety of recent research that has shown that these three typefaces are the most successful at attracting and retaining customer attention. They are classy and contain just enough style to be visually interesting, but are subtle enough that they will not detract from the message. Overall, make sure that your fonts are legible, if it’s even a little bit hard to read, it’s not worth using. Sizing – Did you know that 95% of the population age 35 years or older requires reading glasses? You have to keep in mind that different age groups can see different font sizes with ease, or difficulty, depending on your perspective. A good rule of thumb is to never use a font size smaller than 8 point. Your company name and headline should be large and bold. You want to balance being able to fit all of the necessary information in one place without any of the text seeming cramped. Bigger font sizes will work best for most important information that you want the reader to see first and smaller sizes work best with body copy. Colors – You first need to determine whether you want to choose a monochrome color scheme or prefer to use some color. This decision is based on the tone of your advertising campaign — is it more classic and professional? Is it fun and flirty? Restaurants, clubs, and parks generally go for color schemes because they want to come across as warm and inviting. On the contrary, art museums, car dealerships, and business offices often prefer to use black and white text because it can be seen as more subtly stylish with maturity. Use the latest design tip to persuade your customers and prospects toward print with tactile, memorable marketing! Ready to toot your own horn? Get 20% off your 1st print order with us today. Ping us for a quote today! Did you know that we offer graphic design? We have a very extensive design team here at Thomson. Contact us today for some examples of work we have done!